Can UAVs replace manned aircraft? U.S. Department of Defense Dictionary defines Unmanned Aerial Vehicles (UAVs) as "a powered, aerial vehicle that does not carry a human operator, uses aerodynamics forces to provide vehicle lift, can fly autonomously or be piloted remotely, can be expandable, and can carry a lethal or non- lethal payload" (Newcome, 2004, p 1 10). Although due to technological gap the early efforts of UAV developments were not very significant, the recent developments in UAVs are remarkable. UAVs are used both in civil aviation and more predominantly in airpower operations. Modern military UAVs such as Global Hawk, Predator and Dark Star are increasingly used in the military field. Moreover, as the development continues, UAVs, in the future, will be seen in wider spectrum, including civil and military aviation. The demonstration of a remotely controlled boat by Nikola Tesla in 1898 had led to the birth of remotely controlled Unmanned Aerial Vehicle (UAV), which was invented by Archibald M. Low two decades later (Newcome, 2004 10). Over the last century, UAVs have been used in a number of fields, from agriculture to meteorology and from research to military warfare. In 1941, target drones, the forerunner of modern UAVs, were incorporated with a camera and a transmitter and were radio-guided to hit targets beyond the operator's sight. Later in 1955, this concept was developed to carry out reconnaissance tasks by American 3rd Reconnaissance Group as they lost 25 percent of their reconnaissance pilots in WW II (Necome, 2004 10). UAVs were first used by US Air Force and Navy in Vietnam War. Ryan AQM-34 Lightning Bug and Lockheed GRD-21 used by U.S. Air Force and Gyrodyne QH-50 Drone Antisubmarine Helicoptermm used by U.S. Navy carried out a number of jobs: imagery surveys, pamphlet dispensing and intelligence missions. Further, to perform electronic countermeasures and to launch a number of air-to-ground attacks, modified UAVs were also used. Recent models of UAVs have remarkable capabilities and play a number of excellent roles. Out of nearly 2500 UAVs in the world, 66 percent of them are employed in commercial category, 31 percent in military field and the rest in advanced academic and research (Newcome, 2004 10). Majority of commercial UAVs, namely Japanese radio-controlled helicopters, are used in agriculture purposes in Japan. Similarly, Solar Star with its ultraviolet and infrared photographic capabilities has been used to identify disease, fertilization level, and water stress of crops. In addition, UAVs in other non-military areas also play notable roles. As Newcome (2004 10) states, Aerosonde and UAVs from same family are used to collect meteorological and ecological data such as atmospheric pressure, wind, ozone holes and soil erosion and are used in USA and Canada. Firebird developed by Israeli Aircraft Industry (IAI) was used in USA for wild spotting role for certain period of time. In addition, solar powered UAVs have also been in use since 1974 but are on their way to military use. Military UAVs have been used in a number of countries, such as U.S., Israel, Germany and some others countries in Asia- Pacific and Europe. The modern military UAVs include Predator, Global Hawk, Dark Star, Hauler, Heron and Eagle. These UAVS have a range of capabilities and are used in variety of roles. The famous Global Hawk with 31.5 hours endurance and altitude of 66,400 feet is able to carry 2,000lb payload and observe 40,000 squire miles in all weathers (Mason, 1998 8). It can also fly in civil air space and was used to carry out real time surveillance and combat missions over Afghanistan and Iraq in 2003. Similarly, Predator, with its day-long endurance, is able to transmit real time video and was upgraded to locate, designate, and hit moving targets in February 2001 (Newcome, 2004 10). Even though not made to be stealthy, its characteristics such as shape, fiberglass airframe, altitude and speed make Predator almost invisible without an integrated air defenses and was used in Kosovo, Afghanistan and Kuwait-conflicts. Moreover, Dark Star with its advanced stealthy nature and ultra-long endurance can penetrate risky areas. Similarly, Eagle and other such UAVs have similar characteristics and are being employed in many countries such as France. Contrary to high costs, modern UAVs have several advantages over manned aircraft. 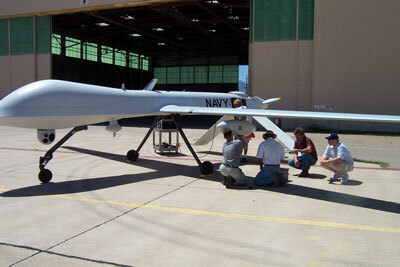 As Heath (2003 5) states, UAVs reduce the manpower required for a particular task. On average, one Japanese radio-controlled helicopter can do the work of 15 labours (Newcome, 2004 10). Similarly, continuous reconnaissance tasks carried out in modern warfare, which can unlikely be done with manned aircraft, are performed effectively by UAVs. Since some of the UAVs such as Predator, are able to find, designate, and strike mobile targets, it was found as these UAVs significantly shorten the kill chain in warfare (Newcome, 2004). In addition, the Dark Star with its designated nature is able to penetrate areas of possible nuclear reaction which is impracticable with a manned aircraft. In general, UAVs are better than manned aircraft for those jobs that are hard, repetitive, and dangerous (Newcome, 2004 10). The considerable current benefits and expected incredible future uses of UAVs have been booming up the effort of UAV and UCAV development in 21st century. While IAI has been enhancing the endurance (solar powered), capacity and ceiling of modern UAVs (Newcome, 2004 10), U.S. Germany and France are on their work to genuinely autonomous Unmanned Combat Aerial Vehicles (UCAVs) (La Franchi, 2004 6) which can carry out combat missions with limited human intervention. Germany is ready to contribute largely into any European UCAV attempt. Furthermore, requirements for a complete independent unmanned air vehicle which can be launched by hand and controlled with a backpack-ground-control- system are under considerations. In addition, U.S Defense Advance Research Projects Agency (Darpa) is developing an innovative series munitions specifically designed for UAVs (Coppinger, 2007 2) and UCAVs that are able to break down electronic components and computer memories with a help of a powerful microwave weapons on board (Fulghum, 2003). Not only America and Europe, but also in Australia is on its way to coast-watch civil maritime surveillance UAVs to replace Bombardier Dash 8s (La Franchi, 2004 6). On civil aviation side, more importantly, the Northrop Grumman RQ-4 Global Hawk has been authorised for civil use and, therefore, according to Ed Walby, Global Hawk business development manager, the US Air Force is on its considerations to extend Global Hawk's potentials in both military and civil applications (La Franchi, 2004 6). United Nations (UN) is know to be the first body taking advantage of this opportunity and is looking for leasing UAVs for its international humanitarian peace-keeping process in Darfur, Sudan, and Georgia (La Franchi, 2007 2). Accident rates for UAVs have been quite high compared to manned aircraft. The cause of this was later found to be linked with human factor with issues such as problems with automation, by relying mainly on the machine to navigate the aircraft has reduced the need for human intervention leading to problems occurring in the aircraft to be unnoticed. Poor supply of instrumentation as well as feedback to the operator has also led to accidents with UAVs. Maintenance problems are also later realized by the aviation industry. The realization of the fact that UAVs were more likely to run into maintenance errors, as there are no pilots onboard to detect the problem. Responsibilities of an Unmanned Aircraft System (UAS) maintenance has to consider the aircraft as well as the communication equipment, modems, computers, radio control units and launch and recovery devices all this compared to a manned aircraft which only needs to consider the airworthiness of the aircraft, has made the job of maintenance for UAVs harder with so many areas to consider and fix. Software based systems used to control UAVs can also sometimes be affected by technical problems such as the computer slowing down or freezing causing the system to be unreliable which could affect the information gathered by the UAV also can be unreliable as it could mean that information is not collected at the standard time. Teleoperation, where the unmanned vehicle is operated by a person at a location, this has resulted in the controller to be given little information about the UAVs visual surroundings leading to the controllers to be uncertain and clueless of what is happening around the UAV. [Hobbs, A, 201013]. The major benefits of UAVs, mentioned above, will drive them to be more significantly used in future operations and will play more distinctive roles. Military use of UAVs will be obvious in most parts of the world including the Asia-Pacific region. The 'quick' victory attained by the U.S. over Iraq in Operation Iraqi Freedom was mainly due to the high tech- intelligence, assisted by Global Hawk (Newcome, 2004 10), which in turn helped the Coalition Forces to attack and destroy control and command of Iraqi leadership (Rooney, 2003 11). Therefore, in future, UAVs will be widely used in intelligence 'gathering' in the world, notably in China, India and Australia who are already investing in it (Newcome, 2004 10). As Heath (2003 5) says, due to advanced technological improvements, human beings will be unlikely to survive in future battlefields. Therefore, manned fighters and bombers, even though they will not completely be replaced, will be used in fewer situations, resulting in more reliance on UAVs in combats. In addition, as UAVs provide the commander a greater degree of situational awareness, they will be preferred over current methods, for example, use of Landovers and light helicopters in the Australian Army in warfare to fly over the enemy territory and monitor continuously (McCarry, 1999 9). Further, since UVAs, such as Predator, significantly shorten the kill chain, in future, it will have an effective role in closing the OODA (Observe-Orient- Decide-Act) loop faster. In general, since military UAVs have a number of remarkable advantages over manned aircraft, UAVs will play a significant role in network-centric warfare in Asia-Pacific (Brent, 2005 1), including Singapore which is currently in talks with German Rheinmetall Defence Electronics (La Franchi, 2004 6), and in the rest of the world. The effort of investments and development has some obvious implications that UAVs and UCAVs will largely contribute to and change the nature of the future warfare. The world is drifting towards high-tech artificial intelligence and weapons of mass destructions (WMDs) (Brent, 2005 1). Asymmetric warfare with laser killing mechanisms, smart bombs, hypervelocity missiles and complex targeting will ensure the use of UAVs and UCAVs in a network-centric fashion (Heath, 2003[((bibcite 2003a). Rather than only unmanned vehicles, unmanned systems also will be airborne for better efficiency and accuracy. UCAVs, which can attain more than 12G, will be more maneuverable than manned aircraft where the pilot can only withstand up to a force of 9G. Therefore, with all its mature intelligence and striking capabilities UCAV will close the OODA-loop even faster than F15 and F16. However, modern AI system is still unable to ensure confirmed- targets i.e. any responsible commander has to reconfirm the targets detected by modern UAVs to reduce friendly fires and civilian kills (Fulguham, 2003 ((bicite 2003a))). Therefore, UAVs and UCAVs, along with manned aircraft, will play extensive roles; from protecting arsenal ships to protecting individual soldiers; from airborne refueling to combat fighting; from gaining air supremacy to suppression of enemy air defenses and from identifying cenres of gravity to assisting all other secondary aspects such as supplies, resulting in an intelligence-based, more organised and accurate network-centric warfare (Heath, 2003 5). Can UAVs be passenger airliners? This is controversial issue. Many authors have comprehensively expressed their opinions. Even though not as significant as in air power, the development of UAVs has some notable considerations for civil aviation use. The UN-plan of UAV use in humanitarian aids (La Franchi, 2007 7) could be an evidence that, in future, UAVs might have a place in commercial side as cargo airliners. Similarly, glass-cockpit in passenger airlines, since it is able to control the aircraft safely from take-off until landing (Casner, 2001 3), in future, UAVs might also have considerations as passenger airliners. However, this issue is not explicitly clear from technological and commercial point of view. As of today, passengers would be extremely reluctant to fly without pilots, simply because public are unaware of the technological factors of UAVs. In addition, many other factors are also to be taken into account before approval of UAVs in commercial airspace. However, since UAVs have powerful reconnaissance and detection capabilities, they will continue to be used in search and rescue, identifying and helping forest fires, monitoring deforestations and ecological aspects, patrolling borders and coastlines, helping in border- checks and monitoring essential infrastructures and supply of harmful materials (Warwick, 2004 12). Not only that, UAVs also will be intensively used in counter terrorism and handling prisoners. In general, jobs that are routine, dangerous, difficult or that require immense manpower will be carried out by UAVs. 1. Brent, K. (Eds.). (2005). Network centric warfare and the future of air power: the proceedings of a conference held in Canberra by the Royal Australian Air Force, 16-17 September 2004. Tuggeranong, A.C.T. : Air Power Development Centre. 2. Coppinger, R. (2007, 25 September - 1 October). US Army to up UAV lethality with miniature munitions. . Flight International, 223. 3. Casner, S. M. (2001). The pilot's guide to the modern airline cockpit. Ames: lowa State University Press. 4. Fulghum, D. A. (2003). Huge promise, nagging concerns. Aviation Week & Space Technology, 159, 7, 44-46. 5. Heath, S.G. (2003). Unmanned systems: A Genuine revolution in military airfares?. The Royal Air Forces Air Power Review, 6 (2), 33-55. 6. La Franchi, P. (2004, 27 April ). Euro Vision. Flight International, 166. 7. La Franchi, P. (2007, 9 October). UN peace-keeping missions could be supported by UAVs. Flight International, 227. 9. McCarry, P. J. (1999). The other side of the hill. Fairbairn, A.C.T. : Air Power Studies Centre. 10. Newcome, L, R. (2004). Unmanned aviation: A brief history of unmanned aerial vehicles. Reston, Va.: American Institute of Aeronautics and Astronautics. 11. Rooney, B. (2003). War on Saddam. London: Robinson. 12. Warwick, G. (2004, 27 April). Remote chance. Flight International, 166. 13. Hobbs, A. (2010). Chapter 16 - Unmanned Aircraft Systems. In S. Eduardo & M. Dan (Eds. ), Human Factors in Aviation (Second Edition) (pp. 505-531). San Diego: Academic Press.